OPI nail colors have been on my wishlist for a while now. They are quite easily available and not terribly expensive either, but I have been hopping back and forth between places (countries/contients really), and that puts a limit on what all I can stockpile and carry around in suitcases - makeup definitely gets the last priority. This year, though, I am hoping to finally post some of my OPI favorites here on the blog, and Lincoln Park After Dark should be a good start. I bought this from Target about a year back, mistaking this for OPI Lincoln Park at Midnight (has shimmer and isn't as dark, I think). No complaints, though, since this is just the sort of vampy, creamy dark nail color that I love. Scroll on for more photos. OPI Lincoln Park After Dark is a lovely creamy, glossy deep eggplant purple-plum shade that can look almost black even in the bottle. 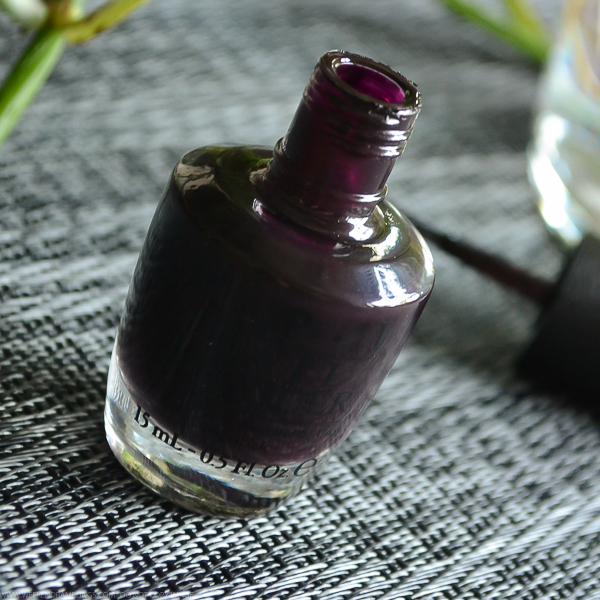 It is a dark color, and I do need to be a bit careful with the application to avoid getting too messy around the nail edges, but this is definitely much easier to apply than a lot of other nail polishes I have tried. On my nails it looks almost black with the purple tones showing up better under cooler lighting. I couldn't get it show up in any of the photos, though. 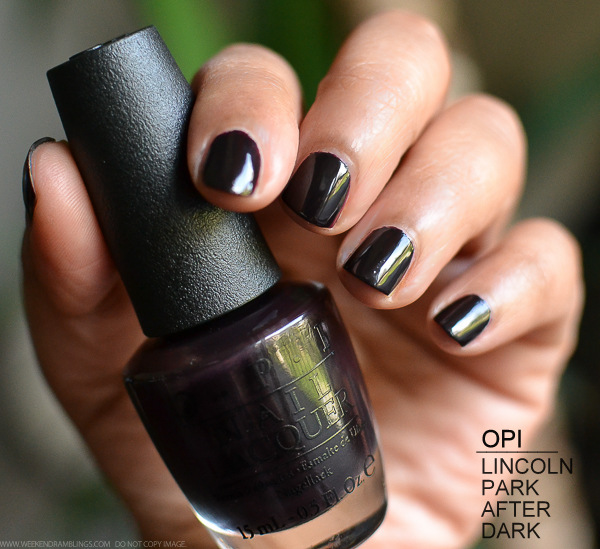 I love dark glossy colors, so it's no surprise that OPI Lincoln Park After Dark would be on my list of must-have nail colors. It's also quite easy to apply (especially for a darker color) and dries to a glossy finish even without a top coat. In the photos above, I have used a base coat by Essie followed by 2 coats of OPI Lincoln Park After Dark. I didn't use any topcoat as I wanted the actual glossiness of the nail polish to show in the photos. In real life, though, I use a top coat to help keep the polish looking fresh. I cannot really comment on how long-lasting or chip-free this polish is since I do quite a bit of chopping/cooking/typing and 3 days is about how much I get out of most nail colors even with a top coat. OPI Lincoln Park After Dark is a classic autumn/winter nail color, though I would wear it any time of the year (and I do). I love how it makes my hands look brighter and makes my short nails look so much more grown up.